To view the entire January 2016 Edition, please click here to view the PDF. The only survivor of a shipwreck was washed up on a small, uninhabited island. He prayed feverishly for God to rescue him, and every day he scanned the horizon for help, but none seemed forthcoming. Exhausted, he eventually managed to build a little hut out of driftwood to protect him from the elements, and to store his few possessions. But then one day, after scavenging for food, he arrived home to find his little hut in flames, the smoke rolling up to the sky. The worst had happened; every-thing was lost. He was stunned with grief and anger. “God, how could you do this to me! ?” he cried. How did you know I was here?….We saw your smoke signal! Early the next day, however, he was awakened by the sound of a ship that was approaching the island. It had come to rescue him. “How did you know I was here?” asked the weary man of his rescuers. We scan the horizon for others passing by our way so that we may alert them to our dilemma. But it’s no use. We don’t see anyone else passing anywhere near where we are living. So we begin to lose hope and go into place where we quit looking for help. We go to a place where we don’t pray for rescue any longer. Instead we begin to survive by trying to do things ourselves. We often find comfort in trying to fix up the issues and situations by walking up and down the proverbial beach and collecting the remnants of our shipwrecked lives. By placing them together, we try to survive on the little shelter and comfort that they bring us. We lay in bed at night wondering why we are faced with impossible odds and why nobody cared enough to rescue us. We wake every day and muster up just enough strength to go out and gather a few more supplies so we won’t starve to death. We use what minute strength that we have to collect some things to keep us warm and comfortable during our trial and the subsequent storms. Instead of allowing God to be our strength and portion, we utilize our hands to build and repair what we think will be our permanent plight. We focus so much on surviving the storm and the crisis that we forget that this world is not our home, but we are merely passing through on the way to glory! We get so caught up in just surviving that we bring all of our possessions close to us as to not let them out of our sight. We pack everything we think that we need in our little hut to make sure that the nothing else bad happens to it. We try out best to protect our remaining treasures and possessions from the elements because we don’t know when we will get to put our hands on more. Furthermore, we don’t know when we will be free from our issue so we do our level best to become self-sufficient. When we become survivalists by self-sufficiency we are removing the hand of God from our lives. When we become survivalists by self-sufficiency we are removing the hand of God from our lives. That hand of God that wants you to be free from your trials and issues. That hand of God that no one can remove you from. That hand of God that will provide your every need if you will let Him. If we keep just surviving, we will get the feeling that we are the ones responsible for our success. We will begin to believe that we can make it on our own and do not need to be rescued. You see sometimes God has to let our “stuff” burn. Every-thing that we have packed in our hut begins to ignite and catch fire. We come back to ashes and destruction that we don’t understand. We even cry out to God that He doesn’t care about us. We are more worried about our stuff than what God is doing in our lives. Sometimes God has to help us understand we were not meant to live beat down and downtrodden. We were not meant to just survive, but God has a purpose for each of our lives. You see if the man’s “stuff” on the island had not caught fire and burned to ashes, the passing ship would have never seen the “signal fire”. He would have never been rescued and would have continued to just survive. By God allowing our stuff to burn, we think that our situation has just gone from bad to worse and it is easy to get discouraged. But we shouldn’t lose heart, because God is at work in our lives, even in the midst of pain and suffering. Remember, next time your lit-tle hut is burning to the ground; it just may be a smoke signal that summons the grace of God. For all the negative things we have to say to ourselves about our situations, God has a positive an-swer for it. 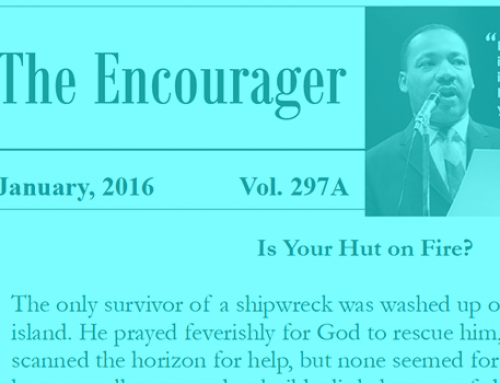 Be encouraged and remember if your hut is on fire, help is on the way! The sound man has the easiest job in every church. All they’ve got to do is please every one of us every time. How long has it been since you stopped by and thanked those who run the sound? They usually only hear from us when we don’t like it. This month’s emphasis for “focused giving”: Bro. Matt Adams wears many many hats but he is the director over two different areas: Sunday School Director and Director of Technology. As Sunday School Director, he is responsible for training new teachers and ongoing education of the reg-ular rotation of Sunday School teachers. He organizes lesson plans and makes sure that each class has a teacher who is prepared to teach, often doing it himself. When issues arise with students (or between teachers and students), he steps in as mediator. He makes sure teachers have the supplies they need to be able to teach effectively. As Director of the Technology Dept., he makes sure all A/V and musical equipment is in working order. This means purchase of equipment, tuning pianos, and very often he saves the church money by doing his own “free labor” in making the re-pairs. He also coordinates issues related to the copy machine and trains and schedules the A/V teams in the back of church during service. In his spare time, he is a preacher, helps Sis. Jennie Adams practicing with the praise team/musicians, and leads most of our services. Focused giving to the Sunday School department will benefit all of our children and young people (2-year-olds through career young singles). Offerings to the Technology Department will help our services run smoothly. Wiring, batteries for the microphones, DVD’s, WiFi, etc….. all of these things cost the church money. Further, our mu-sicians spend a lot of time on the drums, keyboard, piano and organ (and, as you know) they sometimes play them for a solid 2 hours during service. These instruments wear out as well. Please consider these departments in your fo-cused giving this month.